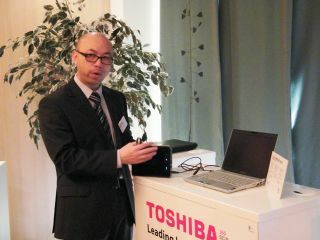 Toshiba revealed a number of battery innovations at its press conference in London this week, with both SCiB and methanol fuel cell chargers getting their first airing in the UK. First up was the company's fuel cell charger. Looking a bit like a DAB radio, the charger is one of the first working samples we have seen of the much talked about fuel cell tech. Acting like a portable mains unit, the charger is powered by methanol – which you squirt into the device through a squeezy tube – the system can handle 14mls of liquid and this turns into about two charges of an empty mobile phone. The charger is compatible with anything that juices up over mini-USB. Each bottle of methanol is 50ml so there is plenty of charging liquid to keep your battery charger backed up. It is a little strange to see that you insert the liquid yourself but other than giving you flashbacks of science lessons back in school it's quite an effective way to make sure you have a battery supply on the move. And Toshiba even believes that you can carry methanol with you on planes. Another charging device shown off was the SCiB (Super Charge ion Battery) rechargeable unit. This looks like it could be the king of charges if it ever reaches the mainstream market. Rapidly charging most devices to 90 per cent capacity in a cool five minutes, the SCiB is as big as a netbook and around the same thickness. The technology inside is EDLC (Electric Double-Layer Capacitors) and the device will not lose capacity, even after a mighty 6,000 charges. Both devices have not been given a UK release date, but it's great to see this technology finally outside of Japan.